Kevin and Kornflake have always secretly dreamed of being Match Game host Gene Rayburn. (Don't pretend you haven't too, you weirdo.) 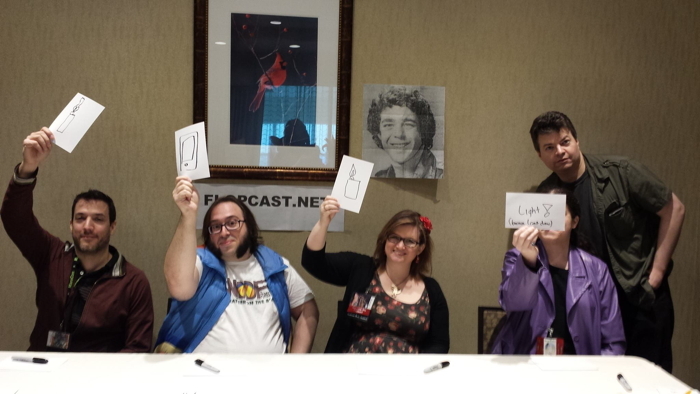 And so for our live version of The Flopcast at MarsCon last week, we decided to play "The Flop Game"! We don't have Charles Nelson Reilly, but we do have a celebrity panel of some of our favorite comedy musicians: the great Luke Ski, Tony Goldmark, Devo Spice, ShoEboX of Worm Quartet, TV's Kyle, Lindsay (aka Lindzilla), DJ Particle, and Rob Paravonian! We have prizes ranging in quality from "pretty good" to "incredibly stupid"! 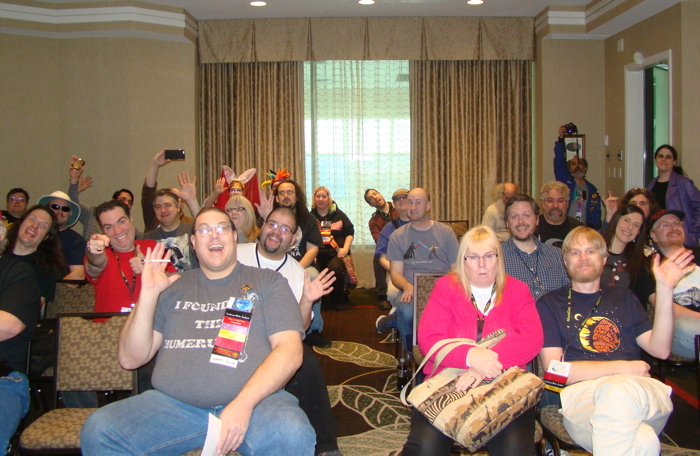 And of course, for players, we have the craziest people in Minnesota — the MarsCon attendees. (Warning: Weird chanting and random singalongs break out frequently.) We assure you, a silly time was had by all... and you can take that to the BLANK. Thanks also to the earlier celebrity panelists: the great Luke Ski, Tony Goldmark, Devo Spice, and ShoEboX! We must express our appreciation for all the folks who showed up to play and watch. Your enthusiasm and musical accompaniment helped make it work! The Mayor of Chickentown was touched by the chanting and singing in her honor. And she loves that XTC song.